Day-by-day, the number of Science & Technology Blogs and Websites are increasing rapidly. 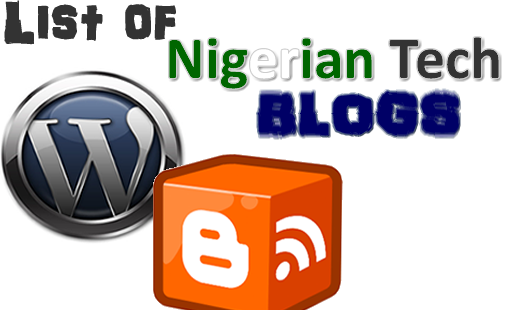 From tens to hundreds to thousands and now millions, some are on the Blogger platform while most are on WordPress but to be more specific, this post will be listing ALL the Tech Blogs in Nigeria (both those that are based & run in Nigeria and those that are based or run abroad but belongs to a Nigerian) but before moving on to the list, I have a question for you – Like how many Tech Blogs do you think there is, in Nigeria? You probably have no idea, right? Well, listed below are the Tech Blogs in Nigeria with no order of importance. Note: This list is arranged alphabetically without any order of importance and it is generated from the list of registered Technology Blogs on the NBA website and Alexa. Technology News and Opinion - Dekstar Inc.
Nice list, so what next ? Well, kindly take your time to check them out and pay them a visit. Do you know of any other Nigerian Tech Blog that is not on this list? Then why not share them with us by using the comment box below? We’d really appreciate that and also; have you seen your blog, a friend’s blog or a blog you know very well on this list? Or do you really find this post so informative & helpful? Then kindly share this post with your friends and others. Don’t forget to subscribe to our free mailing list in order to get our future updates and articles directly into your mailbox. Happy Blogging!!! Thanks a lot Obasi, Same to you Bro. Awsome list I think in will try visit like 10. Nice Blog Zeal, But I noticed your Blog is more of Entertainment, Gossips and Gists than Technology and it also has some Adult contents... I think its better to list it as an Entertainment Blog rather than a Tech Blog. Okay Sir, What's the title of your Blog ? Ayoola i'll need your help on my new blog... Would appreciate any advise u'll give. Wow! Great compilation. Jez stumbled here from google while checking my pagerank. You listed my blog Xclusive Tech. Thanks for the comment Stefn, glad your Blog is already on the list. Kindly share this post with your followers and fans so they will be aware. Hello Stephen, like seriously, TechYan Blog isn't on the list. Would you be kind enough to include it? Cheers and happy blogging buddy. Thanks Buddy, and Yes, i havent registered my blog on NBA, perhaps i should do that asap. Happy Blogging buddy. Okay Bro, thanks for the comment. It will be added ASAP. Nice one but also know www.heroslodge.com its a technology forum. Hi Emmanuel, this post is only for Nigerian Tech Blogs not Forums, you'll notice Nairaland is not on that list also, right ? Hi Adedeji, Amazingnaija has been added to the list. You can recheck and confirm, thanks for letting us know.